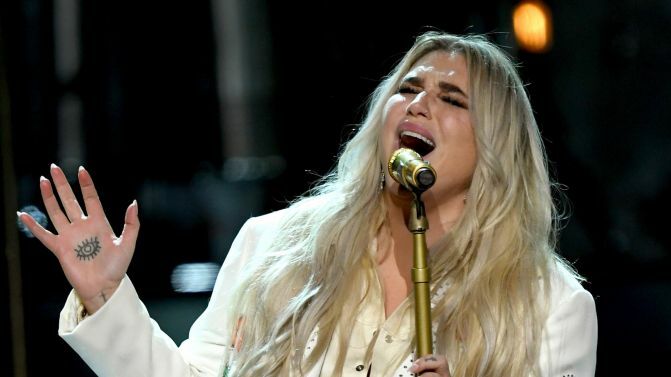 Kesha has left Grammy Awards viewers picking their eyeballs up off the floor with a goosebump-inducing performance of her comeback single ‘Praying’. Her powerful rendition of the emotionally wrought ballad — which takes aim at her former producer Dr. Luke, whom she unsuccessfully sued for sexual assault in a drawn-out public saga — was made even more affecting thanks to the backing choir which joined Kesha onstage. An all-star vocal ensemble featuring Cyndi Lauper, Julia Michaels, Bebe Rexha, Camila Cabello and Andra Day all joined the singer for her big Grammys performance, after which the pop star burst into tears onstage. The performance was introduced by Janelle Monae, who spoke about the #TimesUp movement against sexual harassment. ‘Praying’ appears on Kesha’s latest album Rainbow, which was nominated for Best Pop Vocal Album this year alongside Lana Del Rey’s Lust for Life, Lady Gaga’s Joanne, Coldplay’s Kaleidoscope EP, Imagine Dragons’ Evolve and Ed Sheeran’s ÷. ‘Praying’ also received a nod for Best Pop Solo Performance. Catch Kesha’s stunning Grammys performance below, and you can see her do it live when she brings her Rainbow tour down under in March.